Ariyana Beach Resort & Suites Danang boasts one of the best locations along Vietnam's stunning central coast. The Ariyana Joint Stock Company has announced to beginning of construction of Ariyana Beach Resort & Suites Danang in the premier location of Bac My An in the central city of Da Nang. On one of the best beaches in the world, it offers modern living with international-standard architecture and services. A condotel project, Ariyana is among the most outstanding projects within the architecture master plan for Da Nang, one of Vietnam’s most livable cities. Ariyana Beach Resort & Suites Danang is the only project with a premier location on the beach and is just ten minutes from the center of Da Nang and 15 minutes from Danang International Airport. It is also located within the Ariyana Urban and International Tourism Complex, which covers 27 ha. The north of the condotel project is near Furama Villas and the Ariyana Danang Convention and Exhibition Center and the south is adjacent to the five-star Fusion Maia Resort, while a military airport lies to the west. The resort’s location on Vo Nguyen Giap Street also makes for easy access to UNESCO World Heritage Sites such as Hoi An ancient town, the My Son Sanctuary, the former imperial capital of Hue, and Phong Nha - Ke Bang National Park. The street is also known as a “five-star” boulevard as it has become home to a number of luxurious resorts. Ariyana Beach Resort & Suites Danang was designed by architect Andrew Frost from Darkhorse Architecture. He graduated in interior design in the US and has 18 years of experience in designing hotels and condominiums in Australia and is a member of the Australian Institute of Architects. He brought a contemporary and Oriental essence to the resort in a modern, friendly, fancy, luxurious and opulent style. Ariyana is the only project in Vietnam where all condominiums have views over the ocean. The condotel project has three main towers: North, South and Elite. All have an ingenious layout and are connected to each other by a landscaped promenade with swimming pools. The project’s water landscapes cover more than 1,700 sq m in total and it has an indoor swimming pool combined with a luxurious spa and health services area. Ariyana also has a number of restaurants, bars and lounges to choose from, serving Asian specialties and Western favorites. The first and second floors of the three towers are service areas that include all the luxurious facilities and services one requires for a dreamy vacation. 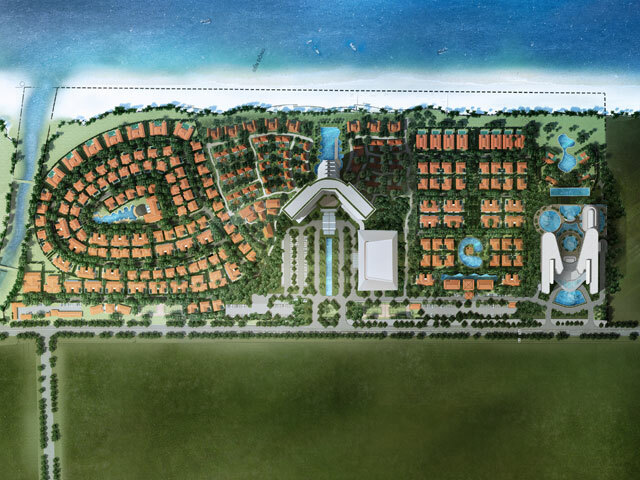 Ariyana Beach Resort & Suites Danang is being developed by the Ariyana JSC, an affiliate of Sovico Holdings. Sovico Holdings is well-known throughout Vietnam with a range of projects and companies including HDBank, Vietjet Air, Phu Long Real Estate Company, An Lam Ninh Van Bay Resort in Nha Trang, Evason Ana Mandara Resort in Nha Trang, Furama Resort Danang, Furama Villas Danang, the Ariyana Danang Convention and Exhibition Center, Holiday Inn Airport Plaza in Ho Chi Minh City, Hoang Anh Dat Xanh Da Lat Resort in Da Lat, and Saigon Phu Quoc Resort & Spa on Phu Quoc Island.